Anti-wrinkle cream for sensitive skin around the eyes. 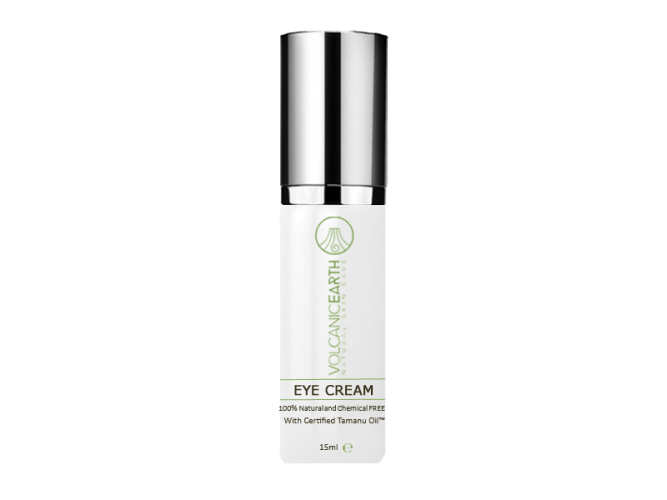 The eye cream offers protection, provides good moisture and keeps the skin supple and soft. The eye cream supports collagen production in the skin. Apply after our night cream. - Content: 15 ml in a convenient roller. Let's say you believe that whole theory of eyes being the windows to the soul; then you probably shouldn't allow the theoretical window frames to appear neglected and unloved. Whether the shadows, bags, and lines are the result of overindulgence, sun damage, or allergies..
VolcanicEarth eye cream can still help minimize the damage done. We are not so much in the business of selling naturally organic skin care products in a world of homogeneous skin care competitors, as we are about offering "Natural Ethical Bio-Friendly Solutions For Specific Problem Skin Conditions". organic moisturiser soften and moisturise deeply into your skin. Volcanic Ash is processed in our Facial Cleanser, Facial Clay Mask, Facial Exfoliant, Handmade Soap with volcanic ash. Volcanic Earth recognises that, as a local company, it also has a responsibility to help improve the standard of living of the islands people so that they at least earn enough cash for life’s essentials such as proper housing, education and medicine. It is through its involvement in this trade and the opening up global markets for its unique products that we seek to be a significant employer for inhabitants but in a way that allows its people to continue to live in happiness and harmony with the beautiful natural (unspoiled) environment and stay in touch with ancient earth. We take great pride in being able to offer you our exclusive range of exceptional organic skin care products, while also contributing to the company's goal of providing much needed livelihood opportunities and employment.